Just like last year, I'm doing another E3 Primer for Dragon Age: Inquisition. However, this time is different. Instead of doing one mega-video with all the information on Inquisition, like I hinted at before and had to postpone millions of times because Bioware repeatedly pushed more information out, I am splitting the E3 Primer it into seven parts. I hope you all enjoy! I'm hoping to release all these primers prior to E3 (June 10-12). Swords. Parties. Dragons. 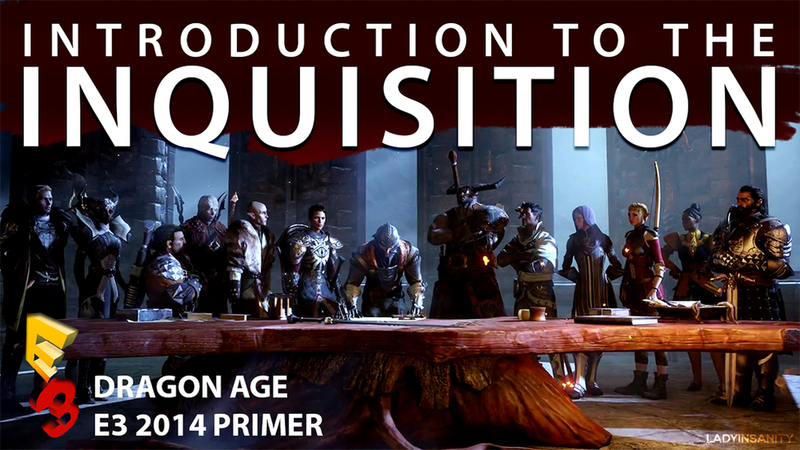 Welcome to Part 1 of my E3 Primer for Dragon Age: Inquisition: so cleverly named Introduction to the Inquisition. My name is Ashe. Together, over the next couple weeks, we will be exploring everything there is to know, so far, about the influential characters of Thedas, the conflicts and war ravaging the lands, and of course...the return of the Inquisition. In the description below, you can fast-forward to any of the other primers. Or simply wait a few seconds and we will get started. Thedas is in turmoil. At the end of Origins, year 31 of the Dragon Age, the Warden ends the Fifth Blight and brings a sigh of relief, as the Darkspawn are pushed back into the Deep Roads from whence they came. But the calm is brief, as more chaos rises up in its place. The Mage-Templar conflict. In year 37, Hawke, known as the Champion of Kirkwall, and an interesting assortment of misfit characters, spurred the mage rebellion in Kirkwall. Most notably, Anders, a mage bonded with the spirit named Justice, destroyed the Kirkwall Chantry and everyone inside it (including Grand Cleric Elthina), an action that forced the mages and templars to finally take arms against each other. After the Kirkwall Chantry falls, more of the Circles fall. The Annulment at Dairsmuid left many mages slain. The White Spire of Orlais left in flames and deserted. Templars and mages have always been at each others' throats, what with the templars' oppressive behavior and more mages turning to blood magic. At this point, everyone is looking for blood in the name of peace. The Qunari lie in waiting, looking for an opportunistic time to conquer the lands beyond Par Vollen. Sten, a Hero of the Fifth Blight, was originally sent to investigate the state of Thedas. After near-capturing Kirkwall but failing to the efforts of Hawke, the Arishok deemed the Qunari return inevitable. While chaos is spurning across the lands, who will dare challenge the Qunari threat when no other nations have the time nor capability to unite? The Orlesian Civil War. The Civil War started in Year 40 with Grand Duke Gaspard de Chalons staging a coup against Orlesian' leader Empress Celene. An effort delayed, as struggle for the throne is still tearing the nation apart. On one side, the great military mind Gaspard heads many of the chevaliers, the greatest and most noble fighters of Orlais, in hope of bringing the Empire back to its roots of conquering the rest of Thedas. On the other side, Empress Celene, who brought a cultural revolution in her nation, controls Halamshiral, the Winter Palace, and those fighters still loyal to the original Empire. And another character that the Warden is so familiar with, a woman who will help the Empress dabble in dark arts unknown. The Civil War continues to spiral in Orlais as both sides collide. Grey Wardens. Suspiciously quiet since the end of the Fifth Blight, the Grey Wardens are turning heads as they silently push their own agenda. Rumors of another Blight circulate in the Anderfels, while the threat of the Architect and even the ancient magister Corypheus still linger. The Grey Wardens' allegiance has always been neutral - always in sacrifice for the greater good and the ending of the Blights. But it may no longer be so, if the Wardens are hiding something truly great for the Inquisition to take notice. Dragon Age: Inquisition is the third installment in the Dragon Age series. The game starts with a peace talk at the Temple of the Sacred Ashes between the leaders of the Chantry and the heads of the mage faction. A mysterious explosion destroys the Temple and kills everyone inside...except the Inquisitor. The blast tears the Veil, the border between the world and the Fade, and demons pour into Thedas. You, as the Inquisitor and the alleged sole survivor of the blast, are marked. Branded with a unique power, one that reverses the effects of the Veil tear and rifts scattered across Thedas. You are in charge of stopping the world from being torn asunder. That is...if you so desire. The Inquisitor, alongside Cassandra Pentaghast, Varric Tethras, and many others both new and old, will re-create the Inquisition: an organization not seen since the Ancient times before the Chantry's inception, but dedicated to rooting out evil and uncovering the truth of who is behind the chaos looming in Thedas. That is the end of this introduction. Thank you for watching. The coming weeks will have more information on the following: the Inquisitor him or herself, characters and companions, factions, gameplay, and more. Be sure to subscribe for all the upcoming videos ahead. My name is Ashe and I hope to see you next time. Take care.